The Challenge: The livestock sector plays an essential but often overlooked role in global development. The meat, milk and eggs that livestock provide can contribute to people’s nutrition and health, and the sector is an engine of inclusive economic growth. So how can livestock be managed more sustainably, safely and productively to achieve these goals, while using precious land and water resources more efficiently and keeping the sector’s greenhouse gas emissions to a minimum? 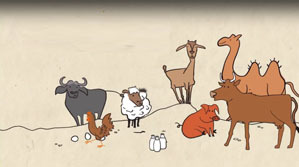 Our Approach: The Livestock Global Alliance was formed to encourage and inform livestock-related policy dialogue, investments and analytical work and is a joint initiative of the World Bank, the World Organisation for Animal Health and the three United Nations agricultural agencies based in Rome. Ahead of their global launch, they approached Marchmont to help them develop a suite of communications materials which would position themselves as thought leaders and advocates. Our main insight for the work was that livestock storytelling is actually about humans as much as it’s about animals. This led to our tagline “Sustainable Livestock, Sustainable Lives”. We then developed a set of key messages and supporting evidence, an animated video, GIFs, an infographic, a PowerPoint template and a corporate video featuring the main LGA spokespeople. Outcomes: To bring these materials to life, Marchmont developed custom illustrations which were used throughout the materials we developed – adding visual energy and consistency. We successfully managed a geographically dispersed group of clients and delivered all of the materials under a tight deadline.